Promising surf athletes will get their chance to shine at the 63rd Owen Chapman Cup surf carnival on Saturday 5 January. The event, hosted by Red Beach Surf Club, is the longest running club day in Australasia for surf athletes and attracts top tier competition from around the country. Close to 300 competitors are expected to attend. But in a twist this year, 18 top lifeguards from the Northern Region will be in Australia for the Trans-Tasman Tri Series to compete against teams from the Central Coast and New South Wales Country branches. Red Beach and Orewa will each be without four of their top competitors, Piha have two in the team and Mairangi Bay have a total of eight athletes travelling to Australia. This leaves the door wide open for the next tier of surf athletes who will be keen to step up to the plate. An added incentive is that there will be prizes for all winners on the day. The Owen Chapman carnival did not take place last year. Poor water quality forced the cancellation of the event and compounding the problem was a king tide close to midday which left no beach for the running of events. It was the first time in the history of this iconic event that the carnival has been cancelled. Red Beach took out the overall points trophy two years ago. 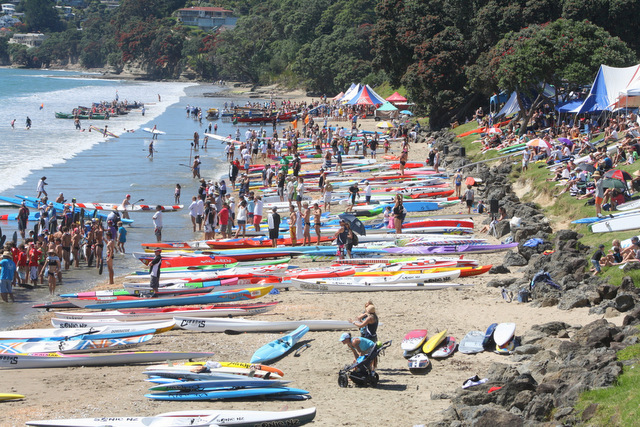 The carnival will also provide opportunities for competitors to assess their chances of success at the three-day Eastern Regional Championships (ERCs) at Gisborne’s Midway Beach during the Auckland Anniversary Weekend. Competition on the day starts at 9.00 am. First up in the craft arena are surf ski races for both men and women, followed by ski relays. The afternoon programme will see the Ironman and Diamond events as well as the Taplin relays. The surf boat and surf canoe arena has a 10.00 am start. Young canoe paddlers who fall into the under-16 category will, for the first time at the Owen Chapman event, have an U16 division to compete in to keep them separate from the U19 division. The beach events of sprints, relays and beach flags will wrap up the day’s competition around 3.00 pm.